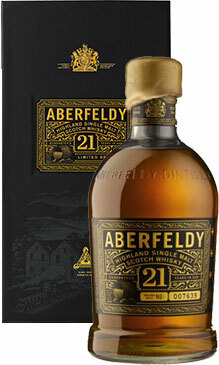 Aberfeldy Distillery is the home of the highly-acclaimed Aberfeldy 12 and Aberfeldy 21 single malt Scotch Whisky. The distillery is located where Perthshire’s highest mountain, deepest loch, and longest glen meet, and is historically and geographically the ‘Heart of Scotland’. Aberfeldy Distillery, founded by the John Dewar & Sons Ltd., was built in 1896 and opened in 1898. 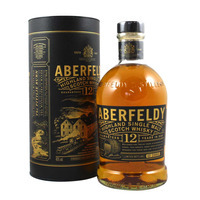 Summary: Aberfeldy 12 Year Old Highland single Malt Scotch Whisky. Aberfeldy is noted for its heather honey nose, fully body and rounded taste. The finish is dry and elegant, with pronounced spicy characteristics and a hint of Seville oranges. Summary: 70cl / 40% / Distillery Bottling – A fruity, clean and polished malt with a touch of honey and spice, Aberfeldy 12 Year Old is an excellent introduction to this Highland distillery. Aberfeldy's main claim to fame is as the heart of the excellent Dewar's blend but whiskies like this are putting it firmly in the spotlight. 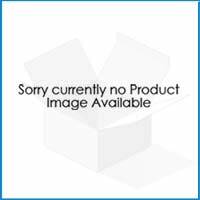 Summary: The red squirrel label is no more. Now in a new blacker design (2014). Mellowed for 12 years in handmade oak casks, this smooth sweet dram offers rich rewards for those who like to dig deeper. 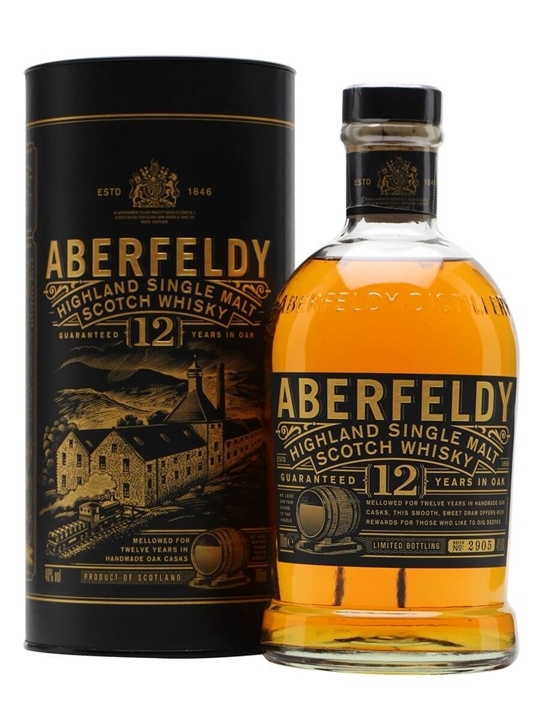 The Aberfeldy Distillery was established in 1898 on the south bank of the River Tay. It combines the fresh spring water of the Pitilie Burn with generations of craftsmen to produce an outstanding single malt whisky renowned for its heather honey softness and full body. Distilled, Matured and Bottled at the Aberfeldy Distillery, Perthshire founded by the John Dewar & Sons Ltd in the Heart of Scotland! 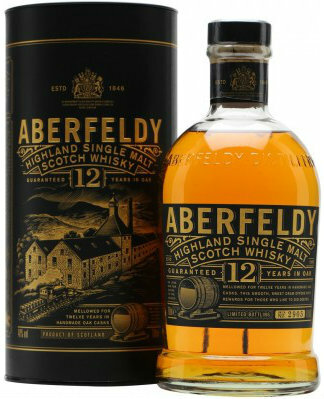 Summary: The Aberfeldy Single Malt Whisky lies at the heart of the Dewar's blends. At 12 years old this is a golden whisky, with an incense-like, heathery honey nose, and a syrupy palate that lingers like a liqueur. Full, golden yellow. Almost incense-like, heather honey with a fruity softness, notes of pineapple, toast and cereal. Syrupy, lingering on the tongue like a liqueur. Full bodied. Full flavour, the perfume characteristics become more spicy, with a bitter hint of Seville oranges in a decidedly dry finish. 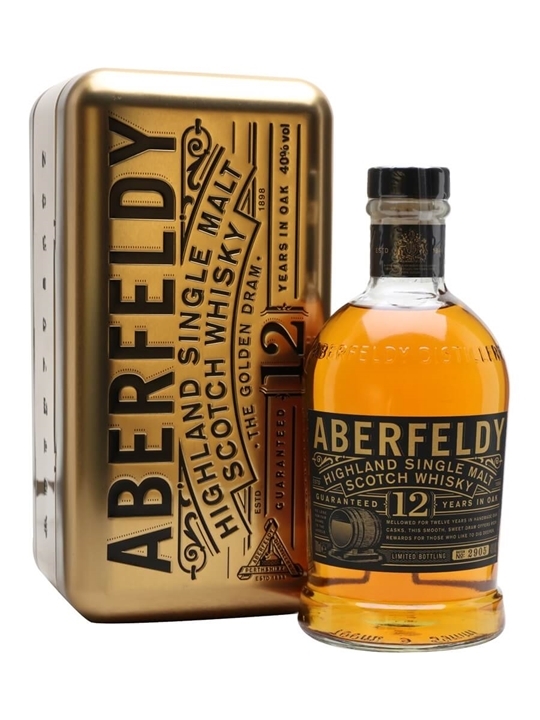 Summary: 100cl / 40% / Distillery Bottling – A litre bottle presented in a golden tin, Aberfeldy 12 is a fruity, clean and polished malt with a touch of honey and spice. An excellent introduction to this Highland distillery. Aberfeldy's main claim to fame is as the heart of the excellent Dewar's blend but whiskies like this are putting it firmly in the spotlight. Summary: Mellowed for 16 years in handmade oak casks, this smooth sweet dram offers rich rewards for those who like to dig deeper. 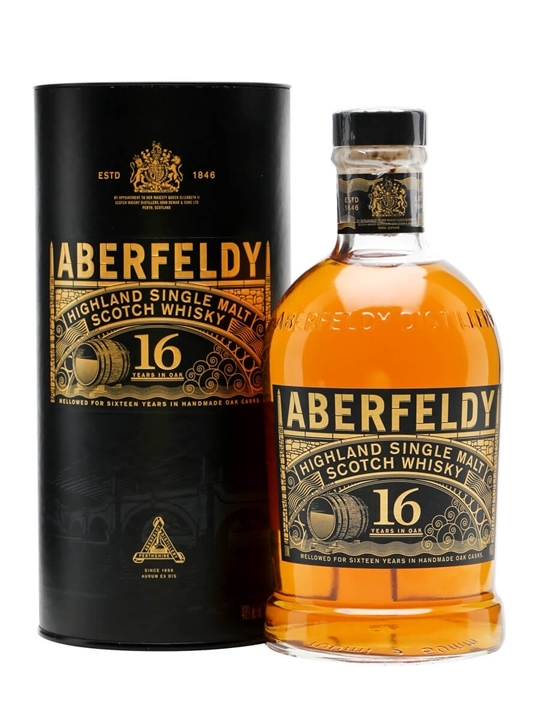 The Aberfeldy Distillery was established in 1898 on the south bank of the River Tay. It combines the fresh spring water of the Pitilie Burn with generations of craftsmen to produce an outstanding single malt whisky renowned for its heather honey softness and full body. Distilled, Matured and Bottled at the Aberfeldy Distillery, Perthshire founded by the John Dewar & Sons Ltd in the Heart of Scotland! Summary: 70cl / 40% / Distillery Bottling – Aberfeldy 16 Year Old was released in 2015 as part of The Last Great Malts series. Matured in a combination of bourbon and sherry casks, this has lovely balance between sweetness and spiciness.  Summary: Buy Aberfeldy 2003 vintage Highland single malt Scotch whisky. Matured in first fill sherry hogsheads and bottled 2017 by Gordon & MacPhail for the Connoisseurs Choice series. Summary: This deep golden whisky has a pleasing heathery honey aroma and a full flavour with touches of Seville oranges, which linger on the tongue. Available in strictly limited quantities.